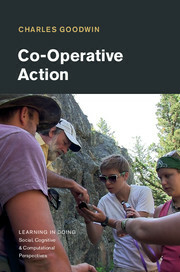 Co-Operative Action proposes a new framework for the study of how human beings create action and shared knowledge in concert with others by re-using transformation resources inherited from earlier actors: we inhabit each other's actions. 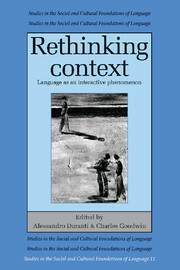 Goodwin uses videotape to examine in detail the speech and embodied actions of children arguing and playing hopscotch, interactions in the home of a man with severe aphasia, the fieldwork of archaeologists and geologists, chemists and oceanographers, and legal argument in the Rodney King trial. Through ethnographically rich, rigorous qualitative analysis of human action, sociality and meaning-making that incorporates the interdependent use of language, the body, and historically shaped settings, the analysis cuts across the boundaries of traditional disciplines. It investigates language-in-interaction, human tools and their use, the progressive accumulation of human cultural, linguistic and social diversity, and multimodality as different outcomes of common shared practices for building human action in concert with others. Charles Goodwin, Distinguished Professor of Communication Studies at University of California, Los Angeles, has received honorary doctorates from universities in Sweden and Denmark, and is the author of 'Professional Vision', the most cited article published to date in the American Anthropologist.